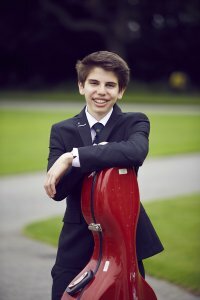 2017 OSE, Aaron Gruen, returned for a flying visit to St Edward’s this week, after spending the summer with a top European orchestral festival for seven weeks of rehearsals and performances at the American Institute of Musical Studies (AIMS). I attended St Edward’s for four years, having joined from Munich International School in the Fourth Form; it is strange to think of my time at Teddies as now being in the past! It’s been an eventful and immensely rewarding summer for me with AIMS, honestly my results in the IB have barely sunk in; the day I received the grades I was straight back into rehearsals a matter of minutes later. I don’t want to sound cavalier about something I’ve worked so hard for, but I scarcely had time to register them! It was a great feeling and I am delighted with my marks, of course, but for me it was the culmination of a 10 year process: coming from Munich International School, the IB was always the path I was going to take, and I have been striving towards achieving full marks throughout. I suppose that would be my take home message: knowing what I wanted to achieve, I always kept that in mind and I was determined to always keep on top of my work, trying to stay ahead as much as possible so that my focus and the knowledge behind it were there when the time came. Looking back on my time at St Edward’s there are too many highlights to list them all, from social events and life in House and the support of my Housemaster Mr Mather, through being part of the running team, to the genuine enjoyment of my lessons – especially chemistry with Mr Richards – and being a Prefect; there’s so much to life at Teddies, it is hard to narrow it down. St Edward’s is what you make of it, the opportunities are endless and, academically, the teachers are always prepared to go out of their way to help you if you’re willing to put the effort in. The support I got in taking my next steps beyond the School was tremendous as well. I’ve known for a while that I wanted to study in the USA, because of the structure of their courses; Mr Vaughan-Fowler really pushed me on this and helped me to realise that it was absolutely the right path for me, encouraging me to put in the research and really know what I wanted. Mr Fenoglio was also a huge support to me, helping prepare for the SATs, and Mr Muir for his support in the new format SAT essay. The whole Careers Education and High Education team were always there to answer questions and offer guidance; it’s a really valuable part of what Teddies has to offer. I really can’t think of anything but positives about St Edward’s and now, looking to the future, I know that I am ready to tackle the challenges and the opportunities ahead.